The King’s Academy offers multiple tracks of study, custom-tailored to the individual student’s talents and aspirations. Students are encouraged to choose the track that best suits them, whether it be a challenging all-around course of study, or one tailored to a more specific interest or goal. This multi-faceted curriculum prepares graduates for a college career built on the cornerstones of intellectual curiosity, ingenuity, diligence and confidence. View the SAT and AP scores for the past two years. High school students are required to fulfill 35 hours of TKA approved community service per year for a total of 140 hours. The purpose is to encourage students to recognize needs in the community around them and to learn to serve others. We designate a week each spring for students to participate in a school-led service trip. Due to the unique nature of TKA service trips, it is strongly recommended that all high school students participate on these trips, annually, to fulfill their service requirement. Students who participate in TKA Service Trips return having had positive, life-changing experiences, and feel encouraged and more confident in helping others in need. Currently, The King’s Academy offers service trips to Mexico, Malawi, Japan, Peru, Ecuador, Kentucky, and Los Angeles. If unable to attend a school-led service trip, students can fulfill their service requirement with Alternative Service, which requires prior approval. 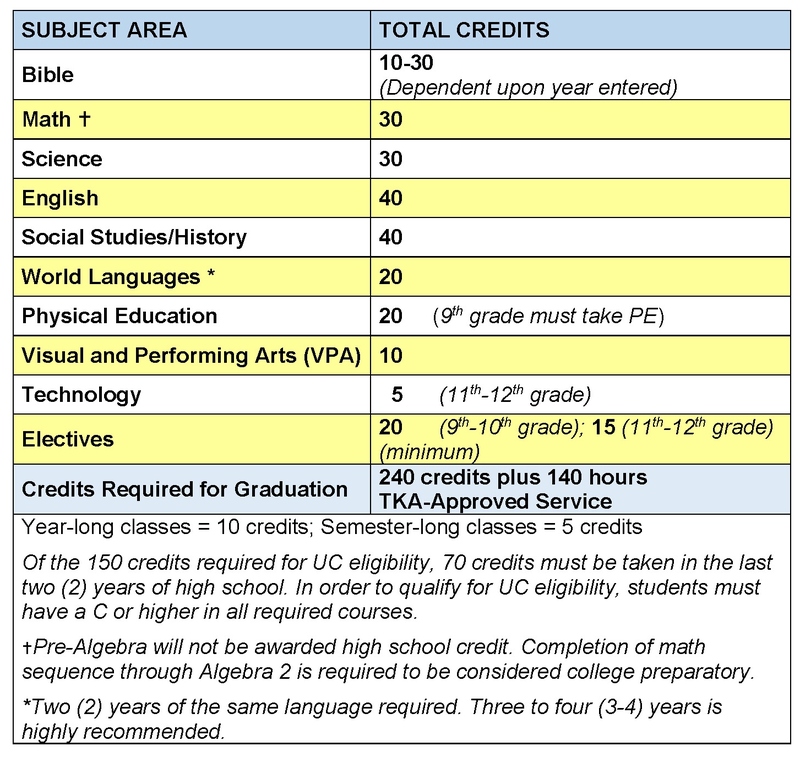 The King’s Academy is a Christian college prep school in Silicon Valley that places a high value on counseling our students through the academic and college planning process. The Academic and College Planning program begins in the 9th grade year and emphasizes a sound foundation for academic and extracurricular planning. An academic planning meeting is scheduled with each sophomore, along with his/her parent(s). Furthermore, each sophomore is registered for Naviance Family Connection which is an online program for career and college planning. At the beginning of junior year, each student is assigned a personal counselor who remains with the student through the senior year. Through the process, students become aware of their talents and strengths, enabling them to use their God-given gifts to pursue their life’s calling with confidence and maturity. Our comprehensive program includes informational presentations for parents at each grade level, individualized counseling, and state-of-the-art tools to assist our students and families in navigating the college admissions process successfully. In the end, students feel confident selecting the college or university that best matches the student’s personal, career and life goals.